COMSOL Multiphysics is a finite element analysis, solver and simulation software package for various physics and engineering applications. 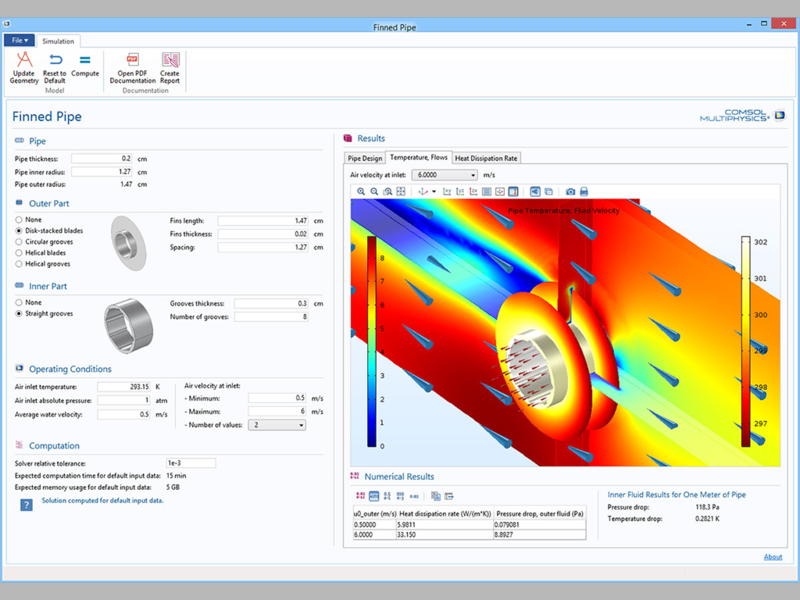 In addition to conventional physics-based user interfaces, COMSOL Multiphysics also allows entering coupled systems of partial differential equations (PDEs). Several add-on products are available for COMSOL Multiphysics, including heat transfer module for 2D and 3D heat transfers. This module contains simulation tools to study the mechanisms of heat transfer – conduction, convection, and radiation – often in collaboration with other physics, such as structural mechanics, fluid dynamics, electromagnets, and chemical reactions. With COMSOL Multiphysics, one can apply simulation to any project, process, or product within an organization. It verifies and optimizes work in real time, without constraints. Heat Transfer simulation investigates the effects of heating and cooling in devices, components, or processes. The module is furnished with simulation tools to study the mechanisms of heat transfer – conduction, convection, and radiation. The Application of this software ranges from Chemical, Aerospace, Automobile, Mechanical Industries. Simulation software is becoming more and more prevalent in product development and design. In such scenarios, COMSOL Multiphysics is the ideal platform to work on. Combining Heat Transfer Module with other add-ons from the COMSOL product suite, it can create advanced heat transfer simulations. Students can simulate phenomena like thermal contact, non-isothermal turbulent flow, and heat transfer in porous media, Joule heating, microwave heating, and laser heating. During this training course, you will learn Conduction, Convection, and Radiation from the basics by means of case studies picked up from the relevant industries. It’s a perfect opportunity to advance your simulation skills and maybe show off to your colleagues how quickly you can set up and solve a complex physical model. This course assumes some familiarity with the basic concepts of transport phenomena, especially heat transfer and fluid mechanics.